Burnet has a wide distribution, it is native to parts of Western, Central and Southern Europe, Northwestern Africa and Southwestern Asia. Burnet leaves have a minty, cucumber-like flavour with a hint of nuttiness. It's best to pick the younger shoots as Burnet leaves become bitter with age. Burnet leaves also become bitter when dried so it's best to use them fresh picked straight off the plant. The flavour of Burnet works well in combination with other herbs and leafy greens in a salad, or when used with other herbs as a flavouring for stir fries and soups. Leaves can a crushed and added to cold drinks or steeped in hot water to make a flavorsome tea. Burnet can be used as a alternative to basil in recipes and will add variety to common dishes that may have become stale. Burnet is a low-growing perennial that is vey easy to grow. The plants remain small, only growing about 30cm across. Burnet prefers growing in soil with a neutral pH between 6.6 and 7.0. Choose a growing location that receives full sun or light shade, in warmer locations avoid growing in full sun. Ensure soil is free draining, consider growing Salad Burnet in raised beds if your soil is waterlogged, too compacted or heavy with clay. Dig lots of organic matter including compost, well-rotted manure and worm castings through the soil a few weeks prior to sowing for good growth. If Burnet plants are no longer actively growing, prune off their older stems and you will force the plants to produce lots of new, tasty shoots. Mulch around Burnet plants well to reduce competition from weeds, keep their root systems cool and retain moisture. Burnet will self sow ready throughout your garden, when this happens you can pull out any plants that are old and have become too bitter. Sow Salad Burnet seeds from September to November or from March to April in temperate and sub-tropical regions of Australia. In cooler regions of Australia sow from September to November only. In tropical regions of Australia sow during the dry season from April to July for best results. Sow Burnet seed 5mm deep directly where they are to grow as the seedlings don't like to be transplanted. Space or thin plantings to about 30cm apart to give them room to grow to full size. Sow a few seeds every week to ensure you'll have a continuous supply of fresh new Burnet leaves. Salad Burnet seedlings take between 7 and 18 days after sowing to emerge. 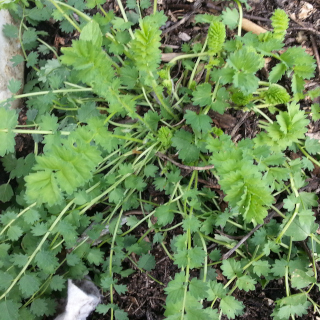 Salad Burnet takes between 8 and 10 weeks to start producing good quantities of leaves.